1-The construction of the Moravia Cultural Center, designed by the famous Colombian architect Rogelio Salmona ( as I stated before- The “master of the bricks”). 2-The canalization and rehabilitation of the stream La Bermejala, accompanied by a bike line and a sometimes very narrow pedestrian pathway. The surrounding streets were also redone. New materials such stones and bricks were used; trees, planters, railings and new lighting- all of these similarly parallel the treatment and aesthetics of other interventions in the city (library parks). 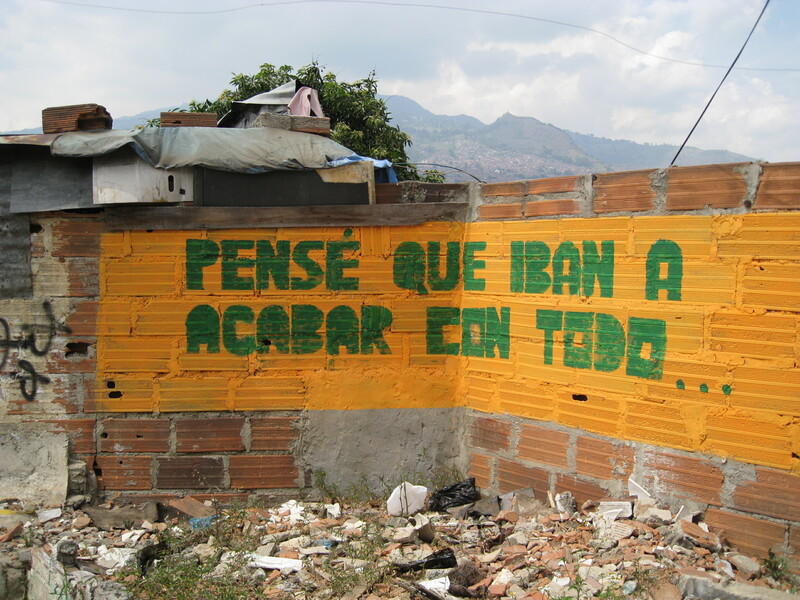 3-The construction of a Health Center and small plaza. 4-The construction of a Kindergarten/Day Care Center. 6-The clearing of the Morro (parts of the base but mostly the highest points), as well as parts of the Oasis deemed as “unrecoverable sites”. 1- The center Cultural Moravia is located at the corner of the Carabobo street- an avenue that extends to the city center and was recently renovated by the government. In this regard, wider sidewalks were constructed, including a bike lane (In a small parenthesis, I have to add that the bike doesn’t work too well since it is at the same level of the sidewalk and instead of bikes, some motorcycles have begun to appropriate it…). As expected with a Salmona Design, the Cultural Center’s main material is brick. This material is continuous on the walls and on the ground as well as on the exterior and the interior of the center. It is interesting that the use of brick provides, at the same time, a similarity and a strong contrast to its surrounding. It is the same material used in most of the surrounding constructions- although it is a more “refined brick” with a lighter tone. The circular architecture and treatment of the ground provides a strong contrast to the concrete floors and streets and the very geometric rigidity box like structure of the barrio’s houses. 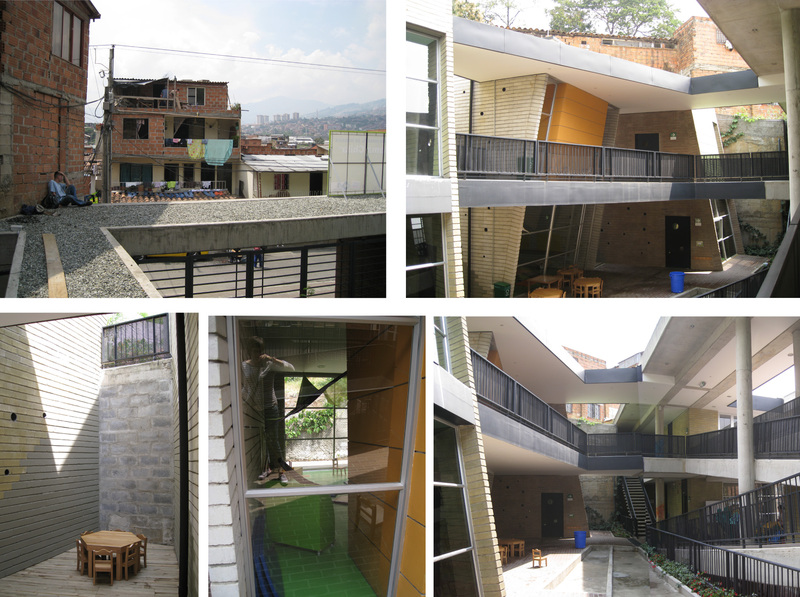 The entry of the Center is an open courtyard, which not only provides a semi public space where many people sit and rest, and distributes the different programs in a U shape amongst 2 floors. Although the center is technically public, there is a controlled entrance (glass doors next to the courtyard) and some additional glass walls/partitions were added on the terrace. 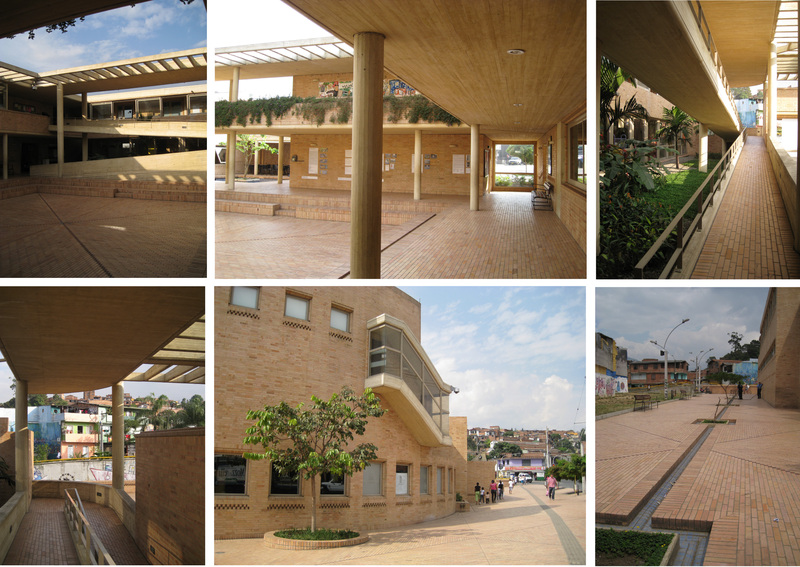 The building does not take the entire corner of the block, but left a generous space for an exterior plaza, which surrounds the entire building and borders, at the front, the Bermejala stream. As such, this plaza, equipped with a small fountain, 2 bronze sculptures, and some trees, directly leads to the “linear park”. 2- The linear park basically consists of a canalization of the Bermejala Stream with a narrow pedestrian and bike path (sometime too narrow to be both), as well as lighting, some trees and a small area where food kiosks where installed (about 5 or 7). I do know that the linear park respected an existed street and there was minimal displacement… There are also some bridges crossing the canals and connecting some of the most transited streets in the area. In addition, the ground treatment extends into some of the feeding street. 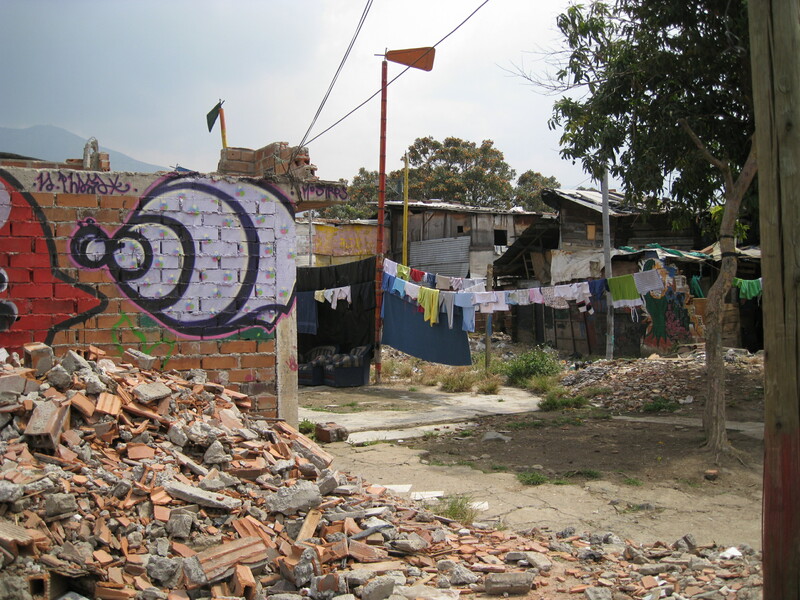 ATT: Contrary to what we saw in Guayaquil, the facades of the houses remain untouched, and the main strategy consists avoiding fences or gates. 3 & 4- The Kindergarten took the place of 2 or 3 houses. The Health Center (nothing spectacular in design) is located on a street corner in the interior of Moravia; the structure is also made out of brick and concrete. 5- I think that the intention behind the arepa factory, although not an outstanding design, shows us a good direction in the type of intervention that needs to occur in the area. It consolidated an already existing occupation and created more employment opportunities for the community . In addition, it reflected to the rest of the city, a completely different and better side of Moravia. Nevertheless, I think that these projects can and should not only provide employment for the area, but should also be a self sustaining and productive. In the case of this former dumpster for the city, perhaps a project geared to bio-energy makes sense (using the methane that is released from the ground). 6- The entrances to the Oasis and the Morro are located next to Pablo Escobar Soccer field and a small renovated park. 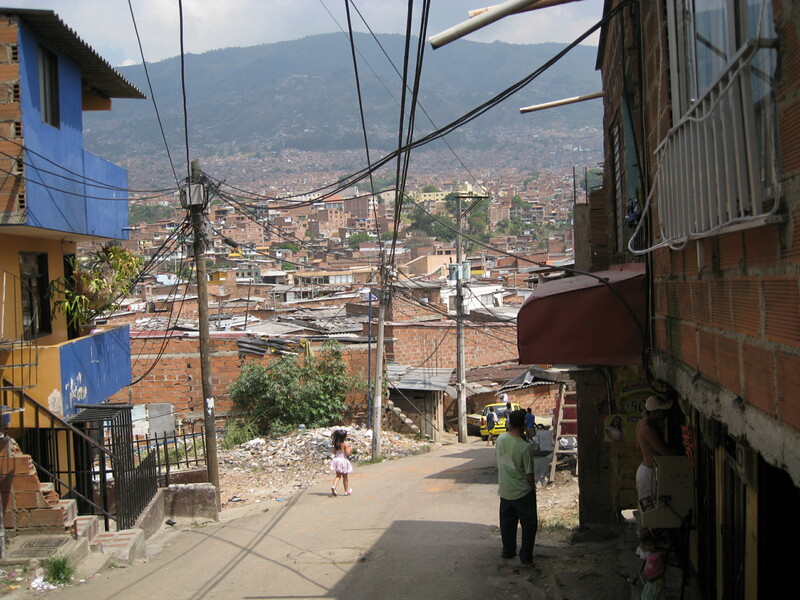 More specifically, the Morro contains the locations where some of the most precarious structures and perhaps unsanitary ones as well. 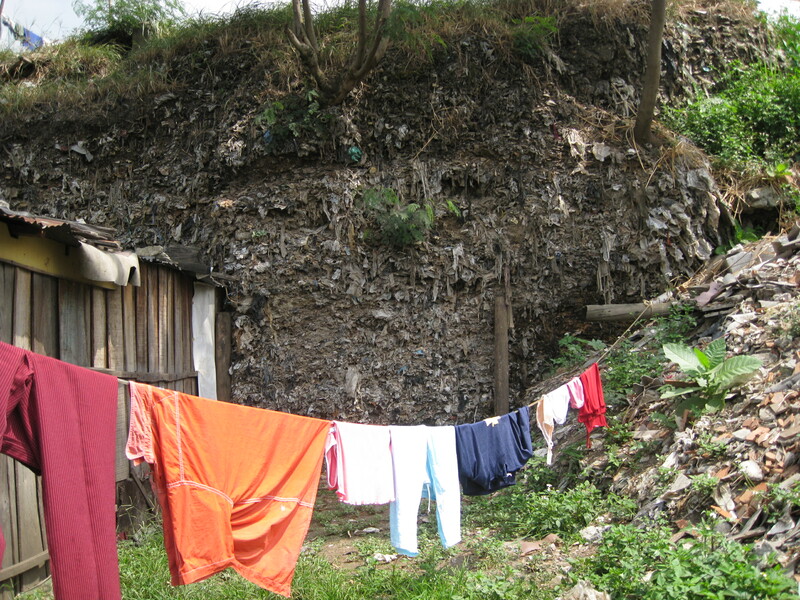 The materials no longer consist of brick and concrete- they are made out of scraps of wood, plastic bags, tin… there are small dirt paths (or carpets over the mounds of garbage) going up the garbage mound. I was shocked by the fact that the government, in order to mark the location of the houses where the some of the preciously displaced houses and homes had been located, used tall colored “flags”. Although these marks can be interpreted in various ways, there is no doubt that the “colonization” is creating a lot of resentment amongst the community. Most of the families are being relocated in public housing buildings. 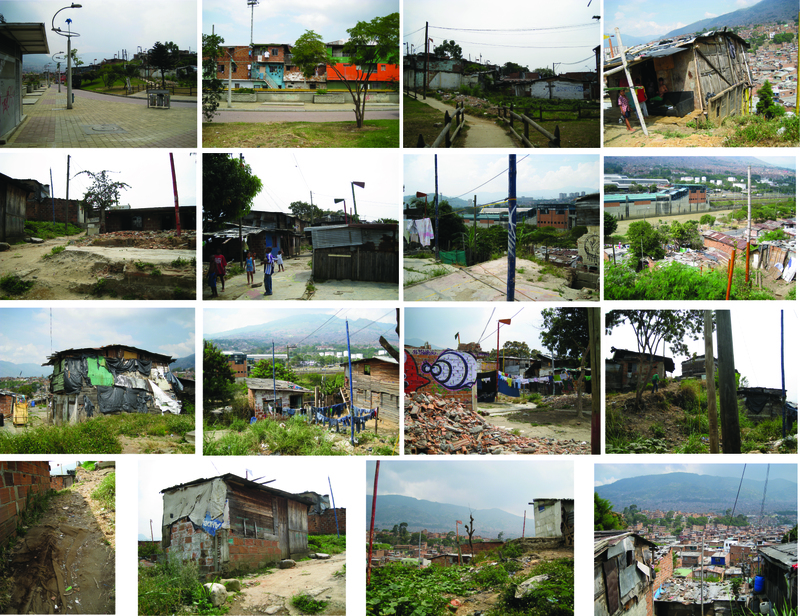 The lucky ones were placed in near by area (you can see the buildings from the photographs- I unfortunately did not get he opportunity to visit them), the others were taken to the other side of the city, in an area called Pajarito were the city is developing an entire public housing scheme (more to come on that in a next post). It is important to note that there are signs of protest around the area- most of them asking for “the right to dignified housing”.